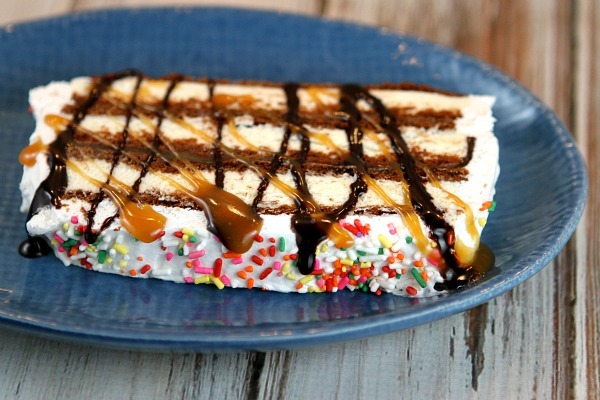 Check out this Easy Ice Cream Sandwich Cake recipe! Click below to view a short video showing you how to make this recipe. Then scroll to the bottom of this post to print the full recipe. Hi, it’s RecipeGirl sharing a recipe today to help celebrate RecipeBoy Brooks’ 14th birthday (yesterday!) Every year I post a cake to share for his birthday, and this year I decided to share a super Easy Ice Cream Sandwich Cake (it will take you 15 minutes to make) that will be great to make all summer long! 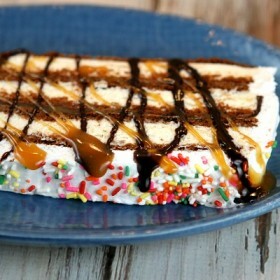 This cake is seriously made out of ice cream sandwiches, caramel sauce, chocolate sauce and whipped topping. That’s it… unless you want some sprinkles too! Here’s what our boy RecipeBoy is looking like these days. 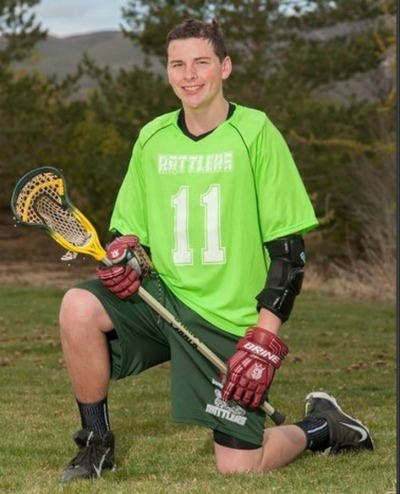 He’s totally and completely obsessed with lacrosse (and he’s good at it too!!) Brooks is now 6 feet + 2 1/2 inches tall. We look up at him now! My husband and I gave him RecipeBoy.com for his 10th birthday, and now he’s FOURTEEN! 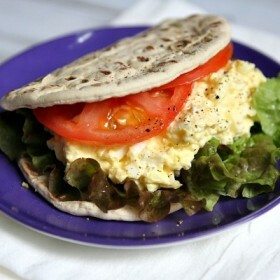 So he’s been trucking along with his food blog now for four years. This summer, his blog will be getting a major re-design- a brand new look and lots of cool new features! So here’s how you make this awesome easy ice cream sandwich cake: Place three ice cream sandwiches on a plate. 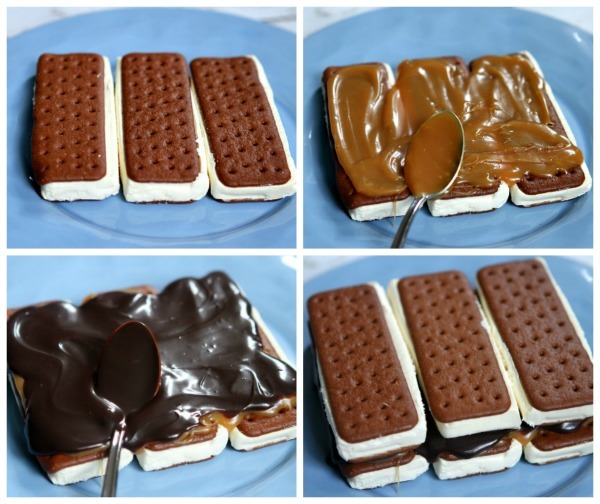 Spread caramel and chocolate sauce on top, and then add three more ice cream sandwiches. Spread caramel and chocolate sauce on top again, then add three more ice cream sandwiches, and then cover the whole thing with whipped topping. Add sprinkles if you’d like. Then place the cake into the freezer for several hours until it’s nice and firm. Slice it up! Drizzle with more caramel and chocolate, if you want. See how easy that was? The great thing about this cake is that it’s a super simple dessert to whip up for a summer barbecue. And it’s always a huge hit too! 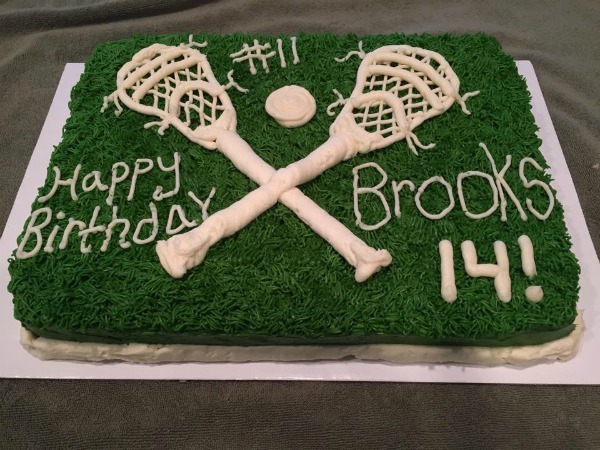 For Brooks’ birthday that he had with friends, I made him a lacrosse-themed birthday cake! I just eyeballed a picture of some lacrosse sticks and used piping bags to draw them onto the cake. I’m not the best cake decorator, but I think it turned out pretty cute, and he… of course… loved it! Happy birthday RecipeBoy! Seriously made in as little as 15 minutes. And so good too! Place 3 ice cream sandwiches side-by-side on a plate. Spread caramel sauce on top, then spread chocolate sauce on next. Add another 3 ice cream sandwiches. Again... spread caramel sauce and chocolate sauce. Add your last 3 ice cream sandwiches, and then cover the whole thing with whipped topping. Sprinkle with sprinkles, if desired. Freeze for several hours, then take the cake out of the freezer and slice to serve. 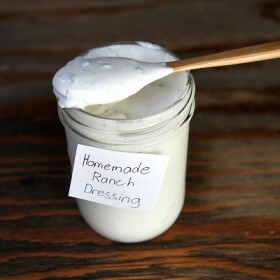 You can drizzle with additional sauce, if desired. This is an awesome idea!!! I never have enough time these days and this is the best idea for a quick dessert! My goodness, I can’t believe how much he has grown. He is such a handsome young man and I know you are so proud of him. I love the idea of this cake. I will have to make for my granddaughter. 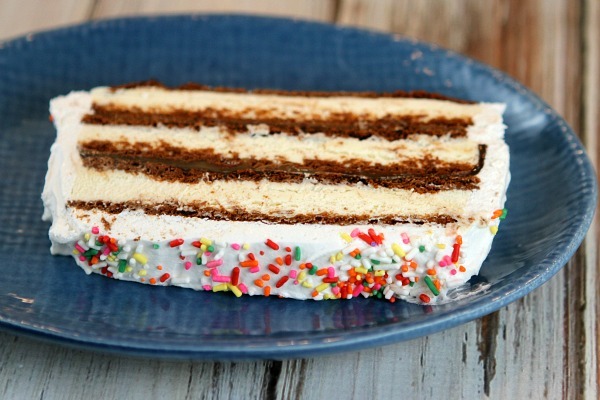 This ice cream cake looks so delicious…I’ve made something similar but it had no caramel. Can you believe? This one sounds much better, and thanks for sharing it! Happy birthday Brooks! I love your ice cream cake, and will be making it for my guys! Happy Birthday, Recipe Boy! Thanks for the inspiration; our son Joe, who is 12, will soon be starting his own food blog due in part to the job you have done in leading the way. Hoping this year is wonderful for you; and keep up the awesome work! Was the chocolate, chocolate syrup or hot fudge topping? A fudgey chocolate syrup that my mom got at Whole Foods. 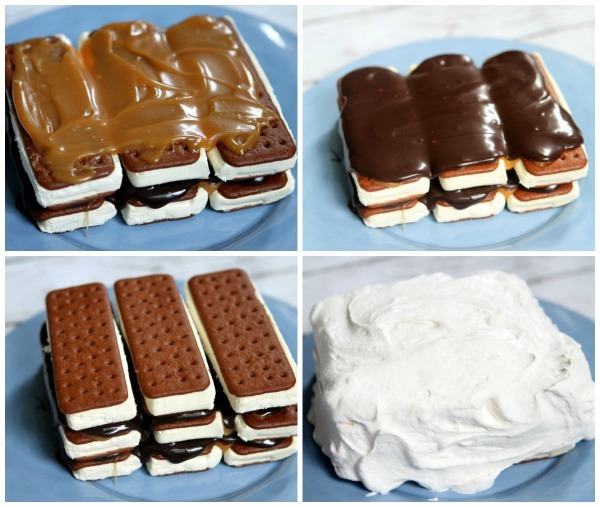 I usually don’t want to share my ice cream sandwiches, but I think I have to make this. My niece could demolish this cake all by herself, but she’s going to have to share with ME! Thanks for the inspiration. I don’t think I covered it.